to 1 million bloggers! 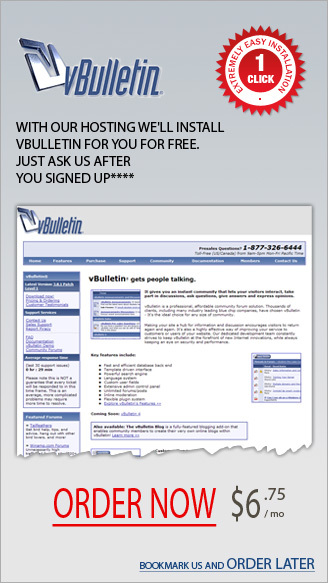 vBulletin is also a great platform for a non-blogging site. It's user-friendly and is very well indexed by the search engines. From your hosting control panel you will be able to install with only one click a number of applications on your site. These include forums, blogs, picture galleries, e-commerce stores and content management systems. Your hosting control panel can be accessed by typing yourdomain.com/cpanel in your web browser. There are a lot of other options available from your cPanel that will allow you to manage emails, FTP accounts, look at site statistics, etc.